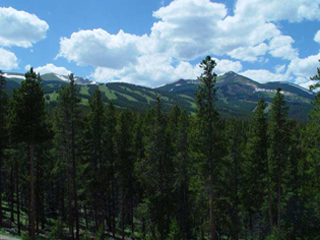 Eagle's View Townhomes are located on Peak 10, just a couple of miles from historic downtown Breckenridge. Peak 10 and Eagle's View boasts some of the most gorgeous views of the ski area and the surrounding peaks. Everywhere you look is gorgeous scenery! Guests can ski in and out from Peak 10 if they are a more accomplished skier or rider (must be able to make it down a black run). Getting to town is an easy 3 minute drive.